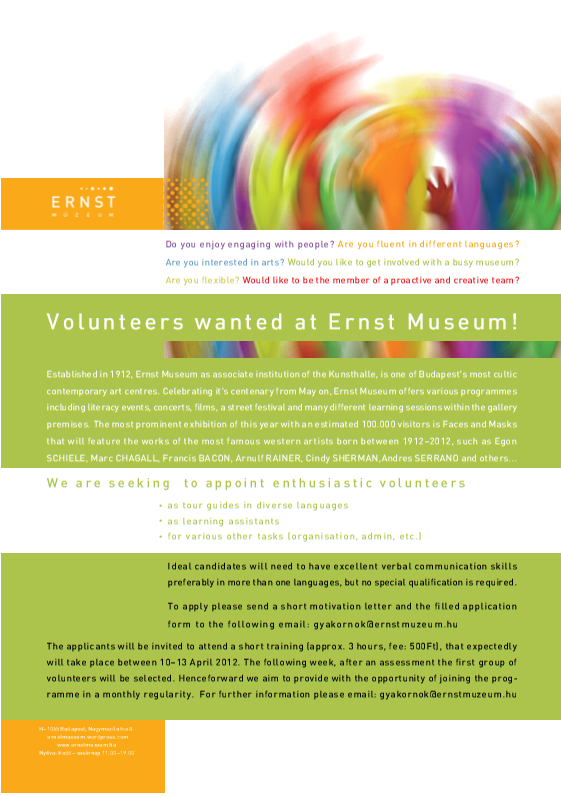 For those whose art is a real passion this spring Ernst Museum makes surprises, opening a new volunteer program to invite amateurs and professionals to become part of any of the gallery’s activities. The program will include several short training sessions to introduce the volunteers to the museum, it’s history and missions, as well as to assign the volunteers to the tasks they would like to implement most. The aim of the program is not only to find forces to enrich the activities of the organization, but also to bring practical skills to the volunteers who are aspiring to have a career on the sphere of art and culture. If you are interested to devote several hours per week for the public sake, or would like to develop presentational skills, or become a part of an enthusiastic team you are the one to apply for a position. To apply you will need to fill in the application form and attach your resume. 04 ápr	This entry was written by ernstmuseumenglish and published on április 4, 2012 at 9:42 de.. It’s filed under About Ernst Museum, Artist opportunities and tagged 6th district, Art, art and society, Art History, Art Hungary, art nouveau, Artist opportunities, Budapest, Hungary, contemporary art, Ernst, Ernst Museum, ernst museum history, ernst museum programs, Ernst Muszeum, Ernst Muzeum, Hungarian art, Hungarian art 20th century, Museum, museum jobs, museum volonteer, museum volonteer budapest, museum volonteer hungary, Muszeum, Nagymezo, volonteer, volonteer ernat museum, volunteer, working in a museum, working in museum. Bookmark the permalink. Follow any comments here with the RSS feed for this post.